This band appeared in Europe thanks to the IAS Label, one of the many Indie French labels who did much to broaden our musical Horizon at the time, along with Closer and New Rose. 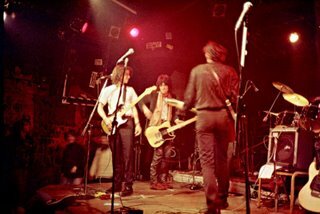 In 1984, after playing in NY under the Limits moniker, Band Of Outsiders joined up with Certain General to record Far Away In America (Sourmash). If anybody has that EP, I would be grateful for a link to it, I never heard it or even saw a copy at the time. They followed with three good EPs released in 1985 and the album Everything Takes Forever (L'IAS). Their sound, while being close to the Paisley movement, has a twang all of its own. 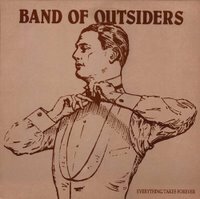 As time went on, The Band of Outsiders introduced in an ever-increasing manner psychedelic elements, favoring atmosphere over melody. "Nervous" and "Skylight" are good examples of their style, but the entire LP is one solid piece of work, their best in my opinion. The song "Dutch Girl Concern" is very high in my All-Time 100 list. The group burned out after Act Of Faith (Barclay, 1986). There is also a live album (Armistice Day, on the Nocturnal and Conviction Labels, 1989) and a Best Of (No Reflection, Repulsion Label, 1992) that I've never heard. They also recorded a Live album with the late Nikki Sudden. The pic below is from that gig. Maybe DorfDiscoBraunFeld has it? I will post next the "Act of Faith" LP as well as 2 of their EPs. This music is timeless for me. I am looking for all material on this band as i only have the "Everything Takes Forever", "Act of Faith" LPs and the "Longer Than Always" and "I Wish I Was Your Kid" EP. Please HELP! Can't say I know this one at all. Looks very interesting. Thanx for bringing it to my attention. Thanks A LOT. Reactions like yours make blogging worthwile! And yes I'd be very grateful for the Up the River mLP. I've heard of them in the 80th ("when I bought the newrose-catalogue" ; ) but never listened to AND what sould I say? ...ok I see, it's never too late: This is a real good album! cool stuff. thanks a lot again! noticed (thanks to you) that all the rapidshare.de files have been deleted… they just have moved them when I switched to rapidshare.com. I'm gonna fix all of them up. You gave me great memories! @ Jano: use the link provided in the post, all other songs exist on the posted LPs.